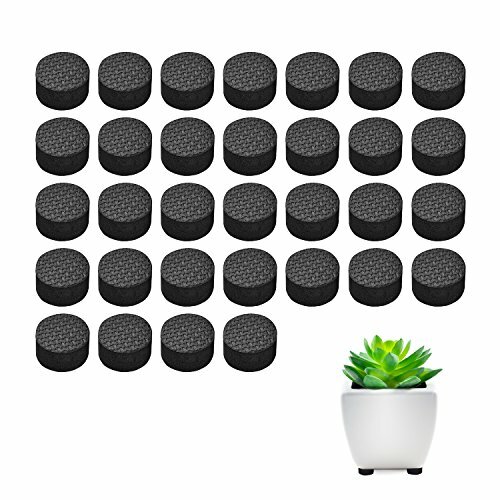 Pot Feet, Basenor Invisible Flower Pot Risers Anti-skin Furniture Pads with Strong Adhesive for Plant Pots, 32 pack by Basenor at Tulips Orchids. MPN: PL002. Hurry! Limited time offer. Offer valid only while supplies last. Have you ever find stains forming around the bases of your flower pots? Do you like to see scratches and scuffs on the floor in your lovely home? Have you ever find stains forming around the bases of your flower pots? Do you like to see scratches and scuffs on the floor in your lovely home? Basenor pot feet is the perfect choice for you! Pot risers with round design is high enough to allow water and air to flow under.Great for your plants. You needn’t to buy another glue.It can can be permanently attached to pots & statuary. Waterproof Surface is equipped with anti-skid texture for batter stability and let water run free under your pots, preserving your patio, decks and pots. With high-density form and it can withstand impacts from stones and rough ground that will last many years. Standard risers 1.2"diameter x" 0.5" ht. and are ideal for smaller pots, statuary and home furniture. We offer 30 days return without any reason, 90 days replacement if the product have quality problems. If you have any questions about this product by Basenor, contact us by completing and submitting the form below. If you are looking for a specif part number, please include it with your message.